Bear fund… the term might seem opposing talking about it when we are currently in a bull market. But every now and then, the question comes to mind. What is the best way to invest in a bear market? After all, what goes up must come down. The question to this can vary from one person to another, from one asset to another. But there are certain assets that perform better in a bear market, that is when the market is in a decline. While not many think about this, especially in a secular bull rally, it pays to be prepared for the worst. Sometimes, the markets can turnaround on a whim, on the most frivolous of reasons. This can leave the unprepared investor holding the bag. A good sum of profits made during the bull rally simply disappearing. Investing in a bear fund makes sense especially when the markets turn frothy. Think of it as an insurance to protect your gains. When an investor buys stock, one of the things that they try to put off is the “what if” factor. What if the markets turnaround? But this is perfectly normal. As humans, we are typically primed to be optimistic. The average stock investor is no different. Quite often lessons are learned after the markets learned. But this comes at a big price. Bear funds, although shunned upon in “good times” can help you to not only protect your gains but also to make money when the stocks are falling. Bear funds are designed to make sure that the fund gains when the stocks are falling and vice versa. Of course, picking the right bear fund at the right time is crucial to one’s success. The success in investing in a bear fund depends entirely on the timing. Many investors tend to time the market and often get it wrong. Picking tops and bottoms seem a lucrative way to trade because it allows traders to enter at an early stage in a trend. But this can also be disastrous. Contrary to the popular way of investing, investors don’t really need to time the market in the absolute sense. This begs the question on where does one start planning their decisions to invest in a bear market? The answer to this lies in the market and economic cycles. This can help you to understand how related investment performance behaves. The cycles can also help you better time your entry into a bear fund. This white paper from the AAII talks about the influence of the market cycles on the stock market. It helps you to understand how the economic cycles shape the stock market behavior. Now that we have the groundwork for bear funds, the next question is what a bear fund is! Should you pick a bear fund ETF or a mutual fund? How Do Bear Funds Work? As the name implies, a bear fund is one that works inversely to the markets. When the stock markets go north, the bear fund goes south. Similarly, when the markets are declining, the bear funds gain. Bear funds come in many shapes and sizes and the investor has the choice to pick and choose. For example, the most common bear funds are those that inversely track the major indexes such as the NASDAQ100 or the S&P500 or the Dow 30. For savvy investors, you can cherry pick the bear funds to suit your investment goals too. Besides the above common bear funds, you also have bear funds based on the asset as well. You can further dig deeper to find bear funds built for a particular type of sector as well. When we talk about bear funds, it is important to note that this is a broad term. A bear fund could simply be an inverse ETF tracking the underlying stocks. A bear fund could also be made of bonds. As you know, bonds are a flight to safety. Therefore, when the market turns, bonds tend to perform well as investors pull out money from the risk assets. You can also various other combinations of bear funds. Most of them are built using an ETF or an exchange-traded fund. You will also find bear funds being common with mutual funds as well. Below are the most popular bear funds you will come across. An ETF or an exchange-traded fund and a mutual fund are two products that look the same. For example, you can have a mutual fund and an ETF that tracks one of the major underlying indexes. The indexes can be anything. Both ETF and mutual funds look similar. However, the difference is quite obvious. An ETF is a fund that trades at an exchange. An ETF, which trades at an exchange behaves similarly to any other stock. It has good intraday liquidity meaning that you can day trade ETF's too. In contrast, a mutual fund can be bought or sold, i.e. traded only once per day. Trading actively in a mutual fund is also tedious. You will have to contact your mutual fund company and tell them whether you want to buy or sell. As you can see, there are some apparent differences between these two products that are identical. If you are a long-term investor, chances are that you are better off investing in a mutual fund. On the contrary, if you want to speculate, then bear fund ETF's make a better bet. There is also a lot of transparency when it comes to dealing with bear fund ETF. These are also more tax efficient compared to mutual funds. Of course, on the flipside, you have to consider the commissions. You pay a commission when you buy or sell an ETF, every time you do it. A mutual fund, on the other hand, gives you the stated Net Asset Value or NAV, which is also the fair price of the fund. When looking for bear funds, you will come across both bear fund ETF and bear fund mutual funds. It is up to an individual's choice on which is a better option to choose. How a bear fund works depends on the product and the way it is structured. Most bear funds structure the investment to benefit from a falling market. Index bear funds for example, make use of the derivative markets to produce daily returns. The returns are more or less equal to the day’s decline in the underlying securities being tracked. The Proshares Short S&P500 fund (NYSEARCA:SH) is a good example. If the S&P500 index falls 2% on the day, the Proshares Short S&P500 fund rises 2%. The chart below shows a comparative analysis of the S&P500 Index and the Short S&P500 index fund. Many other forms of the bear funds are also created by tailoring the exposure to the derivative markets. You can take this a step further and also look for leveraged inverse funds. Leveraged funds, as the name, suggests trade on leverage. Such bear funds, also known as inverse leveraged bear funds can give you bigger profits (and losses too). A two times leveraged bear fund means that when the index falls 1%, the inverse leveraged bear fund gains 2% in value. For most, using a bear fund is a way to hedge against their exposure in the underlying markets. Using leveraged bear funds is ideal only when you are very sure. You can make big profits from the declines. However, most investors simply wish to hedge their long exposure to the markets. A good example of a tailor-made bear fund is the Grizzly short fund. This bear fund takes an individual approach to the stocks. It doesn’t use long positions. The fund has 77 stock holdings that are sold short. Most of the sectors here are tech and industrials. There are apparent risks when investing in bear funds. For the short term, bear funds are valuable. It is commonly known that bear markets have a shorter duration than bull markets. There is also a lot of volatility involved in a bear market. Investors who want to use the bear funds should be aware of the risks. You can pocket big profits if your timing is right. But you can also lose money when you are wrong. This defeats the purpose. Investors use a bear fund as a hedge. Therefore, losing money in your bear fund can be disastrous. It can wipe out any gains that you make from your long positions. Savvy investors invest in bear funds to tacitly make a profit. Thus, they not only hedge their long exposure, but they also profit on the ride down. It is important to know that the long-term performance of bear funds have a poor track record. This is because as we mentioned earlier. Bear markets are shorter in duration when you compare to bull markets. Therefore you should remember that when using a bear fund, you need to think of the short term. The short-term can be just a week at times it can stretch into a month or a few months. The point is that you cannot expect big returns by betting on a bear fund. The above table, courtesy of Morningstar gives a detailed breakdown of the various bear funds. As you can see, investing in a bear fund for the long term can be disastrous. Therefore, investors need to approach with caution. A bear market fund works best for you only in the short term market downturns. We spoke about the risks of investing in a bear fund. We learn that bear funds are not ideal to invest for the long term. But there are ways that you can profit from the decline in markets. Typically, to sell a stock you will need to own the stock in the first place. You can sell short, a process of borrowing the stocks from your broker and selling them. Once you close your sell position, you then return the stock to your broker. There are many implications to this. Some account types such as retirement accounts don’t allow you to sell short. To sell short, you will need to trade with a broker. This can attract additional fees and taxes. Therefore, investors find it easier to invest in a bear fund. Bear market funds have proliferated among general investors in recent year. 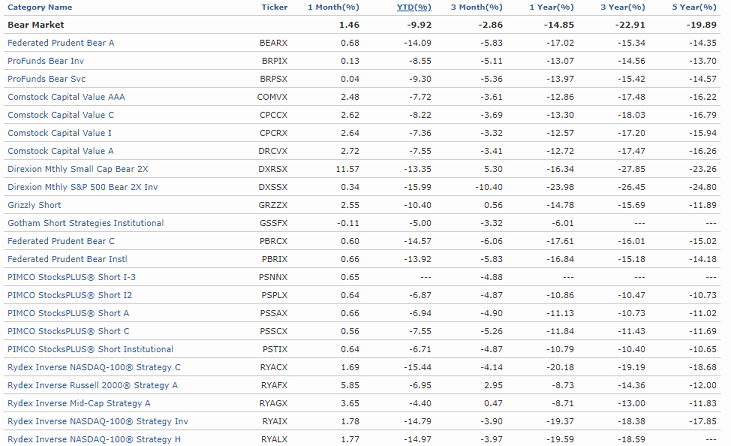 They cover most of the indexes. These days, if there is a market, then you can certainly find a bear market fund for it. Bear funds can cover a lot of markets. Now that we know what a bear fund is and the pros and cons, let’s look at some of the top bear funds. These are the bear funds that are known to give you good returns in the short term. Grizzly Short Fund: The Grizzly short fund always crops up when looking for bear market funds. The investment seeks capital appreciation by selling short stocks (borrowed securities). The Grizzly short fund has average fees with an expense ratio of 2.63%. It has a standard deviation of 13.51. This shows the level of volatility compared to the average performance. Gotham short strategies fund: This bear fund aims to seek capital appreciation and provides positive returns in a down market. The fund invests in both long and short positions. What's unique about the Gotham short strategies fund is that it also has long positions. The long positions are taken in what the fund manager believes to be undervalued. Conversely, the fund also takes short positions in securities that it believes to be overvalued. The fund has returned -2.66% in the year. This is somewhat better compared to the Grizzly fund. In terms of expense ratio, this fund has a ratio of 1.35%. PIMCO StocksPlus Short fund: The PMICO short fund seeks returns by implementing short investment positions. The fund invests in short positions in respect to the S&P500 index. The portfolio also invests in fixed income securities. This brings some diversity to the fund compared to others. The FI securities include bond and debt securities. The securities also cover public and private sector debt instruments. On the year, this fund returns -11.41%. The expense ratio is also small at 1.06% compared to the other two mentioned. Investing in bear funds is useful when you want to hedge your long positions in the market. However, this should be used wisely because in the long term, bear funds underperform. This is due to the fact that bear markets are shorter in duration. Depending on the type of the investment account you use, investing in bear funds becomes imperative to your positions. We outlined three bear funds. You can see how different each one is. When it comes to hedging your exposure, look for the right bear fund. Ideally, investing in a bear fund that has some mix to its portfolio (Fixed income) can help you to weather the short-term downturns in the market. Why not pick a point when the market has had a bull run with the RSI indicating well over bought? Then, take say a 1/4 of your intended investment and begin averaging down over intervals, for example, a 5% fall in the market. If you have picked a good starting point, sooner rather than later you will be in the money!